I wasn’t sure what to expect when coming to Dettifoss. At that point in the trip, I may have been feeling some “waterfall fatigue”. But, then we saw it and I was immediately impressed. After all, this fall is known for being Europe’s most powerful waterfall with an average water flow of 193 m³/s. 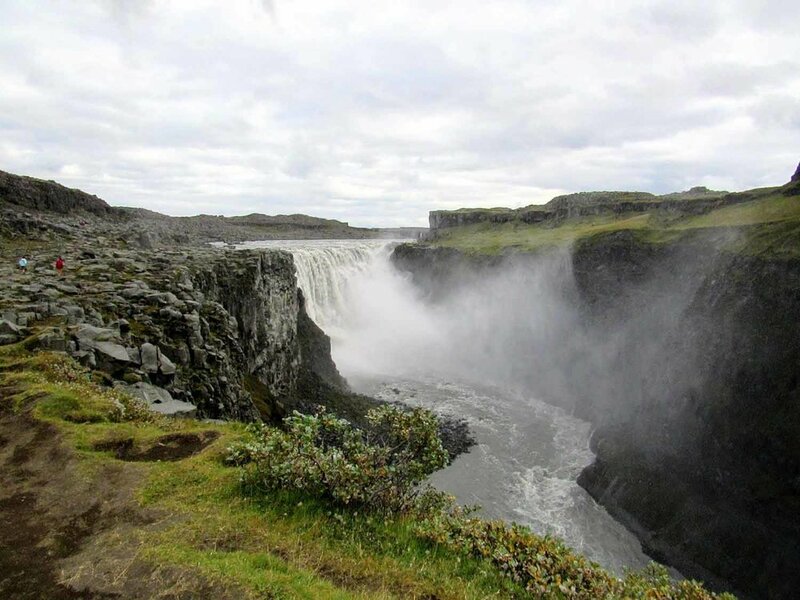 Dettifoss is easily accessible from the Ring Road and is not far away from Akureyri and Húsavík. One of our top tips for those visiting Iceland is to skip the world famous Blue Lagoon. Being so close to Reykjavik has its benefits for those on a tight time frame, but if you can, venture out and opt for a less commercialized hot spring. We choose the Mývatn Nature Baths and (while they are still well-known) didn’t regret it one bit. Not to mention, Blue Lagoon requires pre-booking and is nearly twice the cost - tourist trap! NOTE: You will be expected to rinse off NAKED in a public shower before entering the hot springs. This weirds out most Americans, but it’s a way of life here. Don’t be the weird guy/gal trying to shower discreetly in your swimsuit. Just a short drive from Lake Mývatn, this natural geothermal spring is tucked away beneath a lava cave. Up until 1970 it was a popular place to bath, but the Krafla volcanic system erupted several times between 1975 and 1984, making the water too hot (sometimes boiling). Since then, the water temperature has slowly cooled, but is considered unstable. Bathing is no longer allowed in the spring, but you can dip a finger in, or soak your feet. Acting as the home-base for Lake Mývatn, Reykjahlíð offers all of the amenities you’ll need, gas stations, supermarkets, guest houses (we stayed here), etc. It is also home to the volcano, Krafla. During its eruption in 1727, it raged through the town, destroying all in it’s path except the Reykjahlíð Church. Call it a miracle. Call it a coincidence. Regardless, you’ll call it cool. Today, the church is surrounded by lava fields from that very eruption. Go check it out! In the year 1000, Lawspeaker Þorgeir Ljósvetningagoði declared Christianity as the official religion of Iceland. It is said he threw all of his Norse God statues into the waterfall, and thus the waterfall was named “Waterfall of Gods”. It is quite the site to see, with an interesting landscape to explore (accessible from the East and West side). Goðafoss is located right off the Ring Road. It is well-marked and has plenty of parking. Time to see some whales! We booked our tour shortly before our departure with North Sailing. We saw a whale spouting from its blowhole in the distance, a minke whale, as (whale) as a humpback that came very close to the boat, waving it's fluke at us - a site I'll never forget. What a success! Except... one of us spent the entire three hours sea-sick. In fact, most of the boat was hanging overboard, sick to their stomachs. Our biggest mistake was starting at the higher observation deck of the boat. The water was incredibly rough that day. The swaying immediately made our stomachs turn. Waves were breaking over the bow of the boat and people were slipping all over the place. We were surprised the boat went out in such conditions, but we did return early due to due poor weather. Afterwards we let our stomachs settle while we explored the Husavik Whale Museum, refilled our bellies with the "Americana" pizza at Salka Restaurant, and then warmed back up with a dip in an awesome hot pot just out of town, Ostakarið. This place was awesome. No restrooms on site, but it was clean, included a heated changing facility and only asked for a 300KR donation. Well worth it! Check the weather. We felt pretty silly for paying so much money to be sick for three hours. But, in the end, at least we saw whales. Also, we bundled up, but they provide you with warm clothing, so between their clothing and our own extra clothing, we were actually quite warm which didn’t help with the sea-sickness. Located between Mývatn and Húsavík, the sod settlement of Grenjaðarstaður dates back to as early as 1865. Turf houses aretypical in Iceland because the turf or sod is very inexpensive and provides excellent insulation. Lucky for us, we came across this one in our Rough Guide to Iceland book and decided to make a pit-stop. People were living here up until 1948. It was interesting to see how people of 19th century Northern Iceland lived. We try to avoid organized campsites at all costs. The joy of camping is seclusion - not hearing your neighbors generator at 7:00 am, or the latest episode of whatever series they are currently binge-watching. We didn’t previously scout out any campsites, but check it out. This place is awesome. In Akureyri we checked out the center, wandering through the shops in hopes of finding a souvenir to take home with us. We like to find pieces we can display in our home, rather than touristy trinkets. We purchased a tea-towel with a Scandinavian tree of life motif, which is now framed and hangs in our master bathroom. It is said that Iceland’s greatest outlaw, Grettir (from Grettir’s Saga) sought solitude on the Island of Drangey. He would frequently swim to the mainland to fetch glowing embers for his fire after his own burned out. After making the freezing swim (known as Grettir’s swim), he would soak in the hot water of this natural thermal spring, which came to be known as Grettislaug. Grettislaug is about an hour’s drive from the Ring Road and now costs about 10 USD (7 USD as of Fall 2016). There are two pools built with natural basalt stones whose temperatures vary from 42-43 degrees Celsius. We enjoyed our time here, but recent reviews suggests its going downhill. Fun fact: The word "Saga" comes from Iceland! 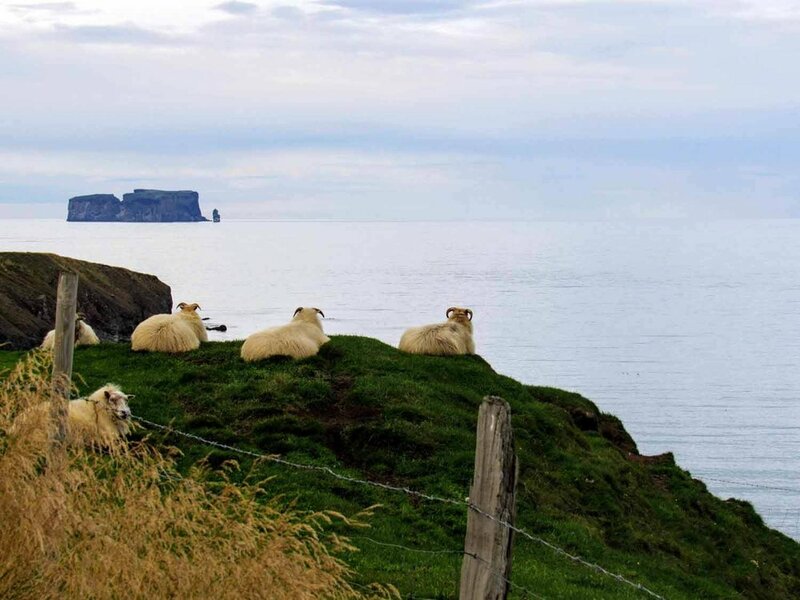 It’s no secret that Iceland is known for it’s high quality wool products. What better place to pick up your own woolen souvenir than the factory itself? Located in the small town Hvammstangi, halfway between Reykjavík and Akureyri, only 5 minutes off the Ring Road is the Kidka Wool Factory. They provide FREE 15 minute tours without any reservation required. We loved getting a glimpse of the Icelandic wool production. Well worth a quick stop. 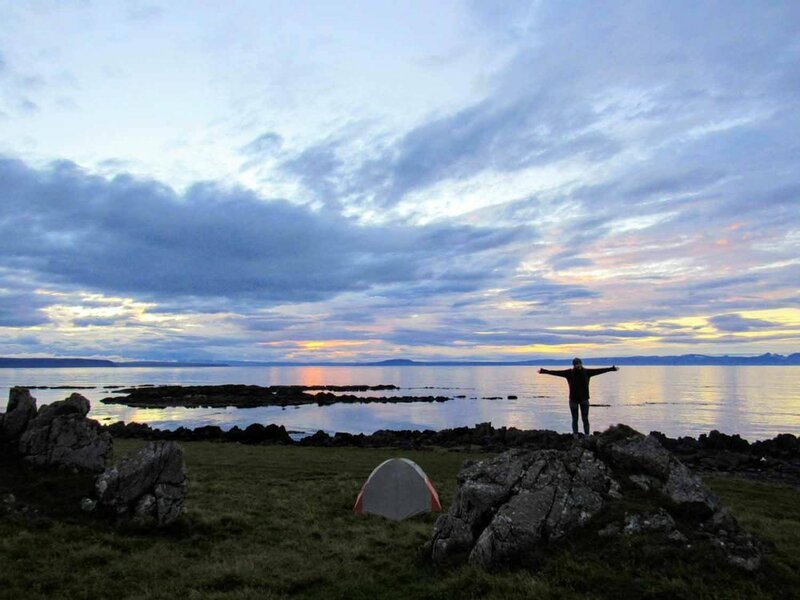 How can this not make you want to wild camp in Iceland?! Although we had no previous planning, we found the best campsites. Don’t give in the organized campgrounds - just think. You could have something like this all to yourself!